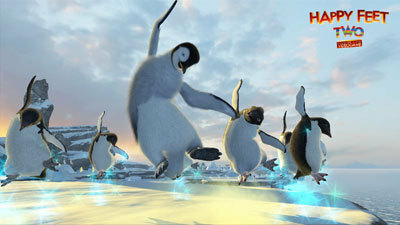 Warner Bros. Interactive Entertainment is happy to announce that Happy Feet Two – The Videogame is now available in stores across North America for the Xbox 360, PlayStation 3, Wii, Nintendo 3DS and Nintendo DS! Rated “E” for Everyone, Happy Feet Two – The Videogame is a 3D musical adventure game for the entire family inspired by the whimsical Antarctic world of the upcoming animated film Happy Feet Two. Happy Feet Two: Erik’s Adventure goes beyond the feature film and creates a fun and exciting interactive experience where young children will enjoy playing, reading, and listening along! 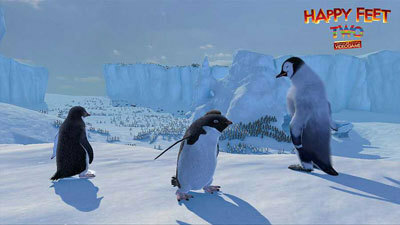 Play as favorite Happy Feet Two characters! Dance with Ramon, slide with Mumble and fly with Erik using the touch screen. 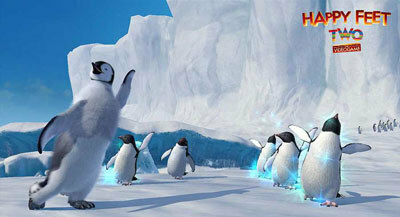 Original music from Happy Feet Two – The Videogame ! Get into the penguin groove with songs from three-time GRAMMY® award winning band Ozomatli! Enjoy a heartwarming story narrated by Lovelace! Made for fans of the movie, the app retells the story of the movie in a fun new interactive way! Fun, replayable mini-games in every scene! Exciting games that move the story forward and increase in difficulty, with a Fish Counter that keeps track of your score. Take pictures of your adventure! Capture fun-filled story moments and save them to the Photo Journal. Engaging adventures with stunning visuals! A more in-depth storyline than other storybooks and brought to life with fully animated real-time 3D characters and environments.